Alex Chatt serves the ball. Chatt is one of three seniors who will be honored during Sunday’s home match against Minnesota. 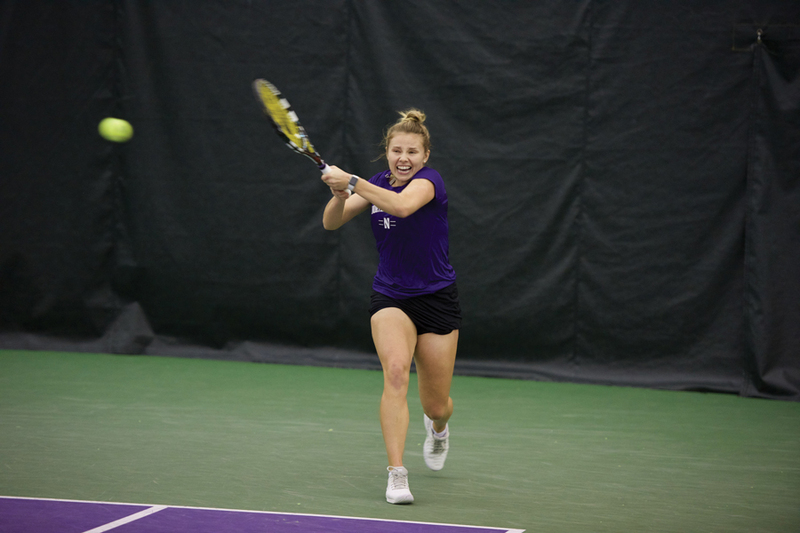 Northwestern will host two Big Ten opponents this weekend with the hopes of extending its unbeaten conference record to 10 matches. The No. 12 Wildcats (15-4, 8-0 Big Ten) will face Wisconsin (8-11, 2-5) on Saturday and wrap up the weekend the following day with Senior Day against Minnesota (13-8, 5-2). NU beat both Michigan State and No. 24 Michigan last weekend to extend its successful run. It has won 12 of its last 13 matches after losing three in a row early in the season. Larner has had a special season thus far. She is currently the 35th-ranked singles player in the nation and holds a 13-1 singles record in dual matches this year. She was recently named Big Ten Athlete of the Week last week for her unbeaten sweep of the Michigan-based teams. However, she said that she took more pride in beating NU’s so-called arch-rival, Michigan, and gaining momentum to finish up the regular season. The Cats will look to start the final part of the year strong against the Badgers, a team that started its season 6-0 but has since fallen off quite a bit. The players said they aren’t taking anything for granted, expressing that they will have to stay focused because they have a target on their back. The same is true for their match on Sunday against the Golden Gophers. Larner, along with her senior compatriots Alex Chatt and Maddie Lipp, will be playing in her final regular season home match for NU. Coach Claire Pollard made it evident that they will be missed. Meanwhile, the Golden Gophers have had a great season in their own right. They have lost just two conference matches and are coming off a win against then-No. 30 Ohio State last Friday. Nonetheless, the Cats have the opportunity to celebrate their senior leaders and cement their spot atop the Big Ten standings with these next two matchups.